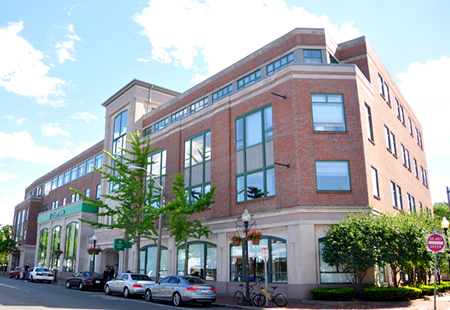 212 Elm Street is a 4-story, 64,616 sf, Class A office and retail building centrally located in the bustling Davis Square neighborhood of Somerville. Truly one of a kind in Davis Square, 212 Elm Street features distinctive architecture, more than 150 underground and surface parking spaces, and a high-tech tenant environment. 212 Elm Street was designed by Arrowstreet and built by Somerset Bank in 1989, and is considered to be one of the best buildings in Somerville. It features modern construction, ample underground parking, and outdoor terraces on the top floor. The building has become one of the area’s premier properties, attracting technology companies looking for Class A space with Davis Square’s unbeatable lifestyle amenities. 212 Elm Street is just steps away from the Davis Square MBTA Station, and due to the neighborhood’s proximity to and similarities with Harvard Square, many consider Davis Square to be within the Harvard Square Cambridge market. 212 Elm Street features prominent tenants including Citizens Bank, Velir, and Powderhouse Productions.